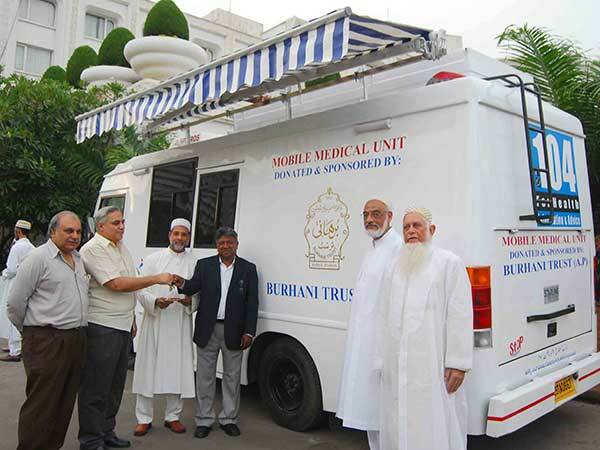 Burhani Trust Andhra Pradesh, a charitable trust founded by Hi Holiness Dr. Syedna Mohammad Burhanuddin Saheb (RA), spiritual leader of the Dawoodi Bohra community, sponsored and donated a Mobile Medical Unit to the Government of A.P. in Hyderabad. Mr. Anwar Saudagar, Trustee - Burhani Trust AP and Vice Chairman - AP Administrative Tribunal handed over the keys of the medical unit to Dr. Balaji Utla, CEO - HMRI and Vice-Chairman, Satyam Foundation. Health Management & Research Institute (HMRI) will provide the medical personnel and run the Unit. Speaking on the occasion, Mr. Balaji appreciated the efforts of the Trust. He informed the audience that the Mobile Medical Unit is a precursor to the 100 vehicles that will be utilised by HMRI from 1st June 2008. A total of 475 units will be functioning by the year end. Mobile units like this will go a long way in overcoming the problem of health care delivery, solve the last mile problem and will act as a platform to deliver medical services, he added. The unit was launched amidst the gathering of Burhani Trust A.P. members, HMRI staff and dignitaries including Justice C.Y. Somayajulu, Justice P. Swaroop Reddy, Justice V.V.S. Rao, Justice B. Seshasayana Reddy, Justice T. Ch. Surya Rao, former minister Basheeruddin Babukhan, etc. The Mobile Medical Unit, costing Rs. 14 lakhs, will provide easy and affordable access to medical services to the needy in and around Hyderabad.